Facebook Rolls Out New Custom Ad Targeting Option: Facebook quietly rolled out the ability for brands to create custom audiences that target users who have viewed their canvas ads on Facebook. Canvas was introduced earlier this year and was designed to be “a full-screen ad experience built for bringing brands and products to life on mobile.” With the release of canvas ads, marketers can now build fully customized multimedia stories using a combination of text, links, images, video, call-to-action buttons, and product feeds to bring brand stories to life. Canvas custom audiences targeting broadens advertisers’ ability to funnel more customers to toward a conversion. 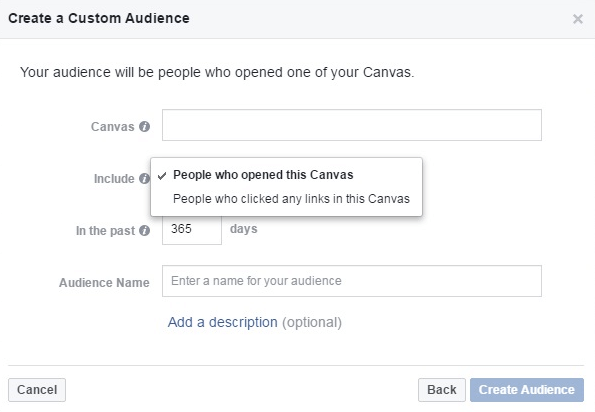 Facebook has added the option to create a custom audience from people who’ve opened your canvas ad. Facebook Adds Link Ads, Enhanced Mobile Websites, Payments, and More to Messenger: Facebook has been “actively building capabilities for brands and businesses to be discovered on Messenger” and added several new features “that deliver value for people, businesses and developers.” Facebook is rolling out Messenger as a destination for news feed ads and is providing a simpler payment process within Messenger. 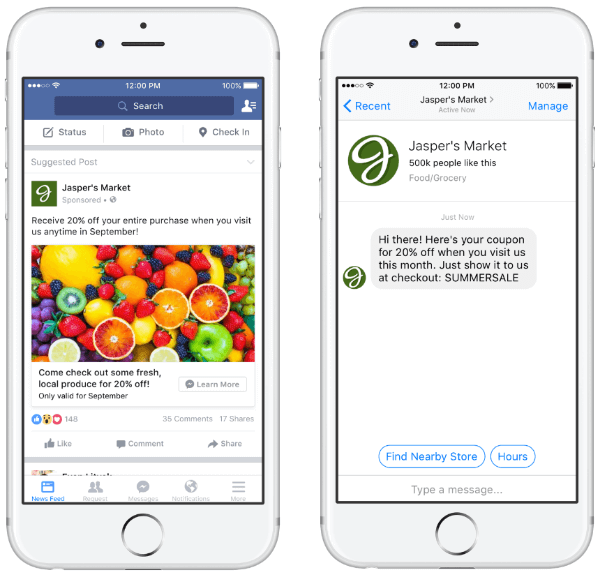 Facebook is also making it easier for businesses to sell products and services directly to customers and is giving users a way to “seamlessly enjoy and interact with a business’ mobile website” within Messenger. More information on these updates and other upcoming features for Messenger can be found on the Facebook for Developers and Facebook Newsroom blogs. Instagram Enhances Call-to-Action Buttons and Video Links on Ads: Instagram introduced four new “action-driving enhancements” that focus on “driving better visibility and interaction for [its] community while driving better performance for [their] advertisers.” The first three improvements involve updates to the call-to-action button on Instagram ads. The call-to-action button will now be “highlighted when people show interest on or around an ad – like resting on the ad for four seconds or tapping on the profile name.” Advertisers now have the option to extend the call-to-action button into the comments section and include prices, URLs, and app store ratings with it. Instagram also announced that links in video ads can now redirect to the destination URL, where people can “explore, browse and take action on a landing page while continuing to watch the video.” The Instagram Business blog confirms that these “new solutions are rolling out over the next month” and Instagram will continue optimizing the way its ads work for both its community and advertisers. 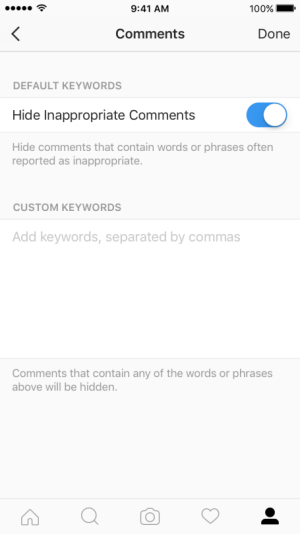 Instagram introduced a new feature that filters comments with words you consider offensive or inappropriate. Twitter Adds New Customer Support Details for Businesses: Twitter introduced “new features to help users find and get help from businesses that provide support on Twitter.” Businesses can now “tell users they provide help on Twitter, indicate when they’re most active, and ensure people know they have the option to send them a Direct Message” on their account profiles. In addition, “businesses can display hours of availability on their profile to help set people’s expectations for when they are likely to reply… and display a more prominent button to start a Direct Message so people know the business offers support privately.” All of these features can be activated from the new Customer Support Settings page on the Twitter Dashboard site. However, they require a business to first enable the setting to receive Direct Messages from anyone. 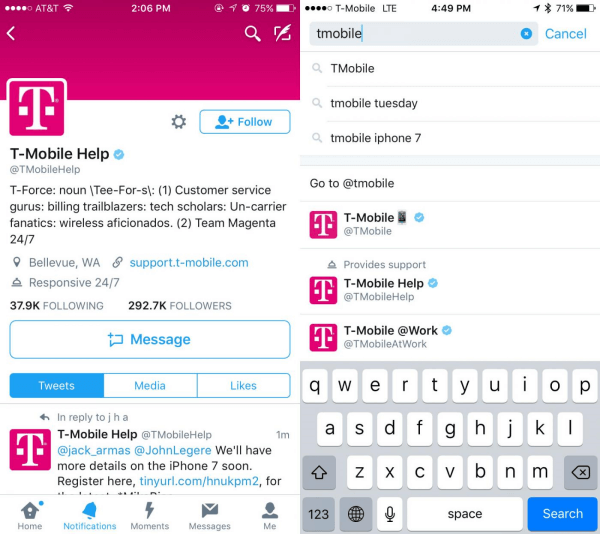 Businesses can now “tell users they provide help on Twitter, indicate when they’re most active, and ensure people know they have the option to send them a Direct Message” on their Twitter profiles. Pinterest announced that “now U.S. businesses can launch campaigns in just a few quick steps” with the new Promote button on pins. In this week’s show from Friday, September 16, 2016, Michael Stelzner and guests discuss the top news in social media. Topics include longer tweets and other updates coming to Twitter, the launch of the YouTube Community and changes to the YouTube ad format, updates to Facebook Live, new live-streaming alerts on Twitter, and the redesigned Periscope app for iOS. Subscribe to future shows here. Twitter Adjusts 140-Character Limit Count: Earlier this year, Twitter announced plans to stop counting @names in replies, media attachments, or polls in its 140-character count for tweets. 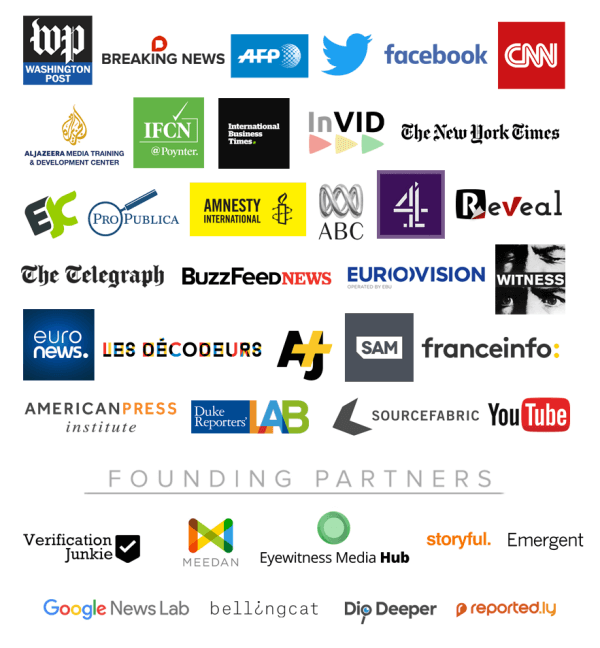 This week, The Verge confirmed that “media attachments (images, GIFs, videos, polls, etc.) and quoted tweets will no longer reduce [Twitter’s 140-character] count.” This change is reported to take effect beginning on September 19. Facebook and BlueJeans Primetime Bring Interactive Video Events on Facebook Live: BlueJeans Primetime launched BlueJeans for Facebook Live, “the first platform for large-scale, interactive video events that can broadcast over Facebook Live.” This new partnership empowers companies and organizations to go from merely promoting an event on Facebook to allowing the network’s 1.3 billion daily active users view it over Facebook Live and giving it the potential “to go completely and utterly viral.” BlueJeans for Facebook Live allows multiple participants to engage in live conversations with viewers and the gives the ability to broadcast any BlueJeans live event to Facebook Live. Brands can try BlueJeans for Facebook Live now with a free 30-day trial. LinkedIn Releases Insider’s Guide to Effective LinkedIn Campaigns: LinkedIn Marketing Solutions published a new ebook, Spotlight on Best Practices: An Insider’s Guide to Effective LinkedIn Campaigns. This resource provides “a behind the scenes tour” of LinkedIn’s advertising campaign process and offers a guide on how to “use each tool in the LinkedIn Marketing Solutions toolbox.” It also includes practical examples from the LinkedIn Marketing team’s own experiences and best practices for marketing on LinkedIn. 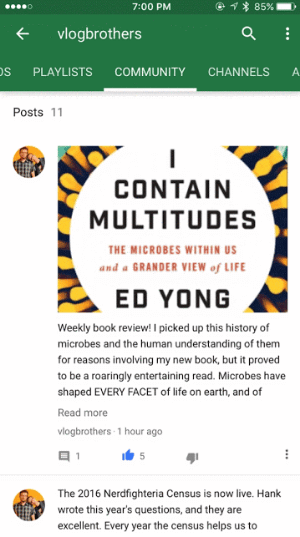 Twitter Adds Notification When Someone You Follow Shares Live Video: Twitter enabled a new Notification button that alerts you when someone you follow starts a live streaming video on Twitter or Periscope. 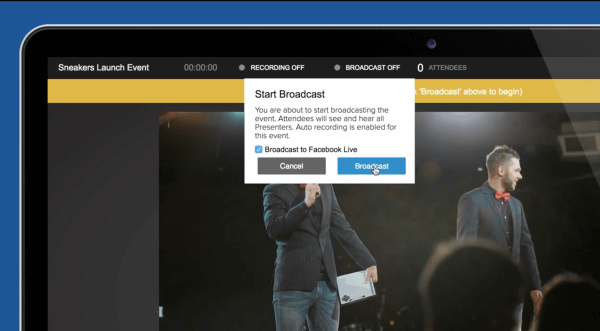 Once users receive an alert, they can then “immediately join the broadcast with just a tap.” TechCrunch reports that this feature “works both for alerting users to new streams from Periscope, as well as for content from Twitter’s live streaming partners, such as the NFL.” The Notification button is available now on both iOS and Android. Instagram Allows Users to Save Their Stories and Mute Others: The Verge reports that Instagram users “will now be able to save the photos and videos that they post to their [Instagram] Stories to the camera roll, automatically by default, and they can also mute the stories of people they follow.” This new extension comes with the rollout of version 9.3 of the Instagram app, along with the ability “to pick a color when you add text to stories” and “mute a particular account’s Instagram story.” This update is available on both iOS and Android. Tumblr Redesigns Explore Tab on Mobile: AdWeek announced that “Tumblr debuted its revamped Explore tab for U.S. mobile users” this week. The new Tumblr Explore tab features personalized recommendations based on “who you are currently following and the type of content that you and the people you follow engage with regularly,” Trending Topics “including the most popular tags and related content,” and the ability to follow Trending Topics so they “will become part of your regular content stream.” The new Explore tab is available for iOS and Android users. Pinterest Launches Pinterest UK Shop: Pinterest introduced Pinterest UK Shop, which is part of Pinterest’s Featured Collections destination. Pinterest users in the UK can now “discover and purchase items from specially curated collections from [their] favorite UK shops and tastemakers.” Every pin on the page is shoppable. “You just need to click on the Pin and click through to the brand’s website to make your purchase,” according to the Pinterest Blog. 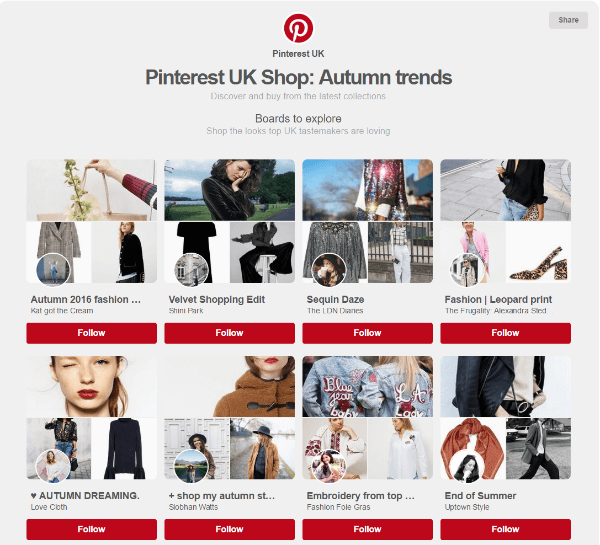 Pinterest introduced Pinterest UK Shop, which is part of Pinterest’s Featured Collections destination. Periscope Adds New Features for iOS: Periscope rolled out “new features for people using Periscope on iOS devices, with some fun, new ways to express yourself and discover broadcasts on Periscope – and elsewhere!” The global feed will now “highlight broadcasts that feature similar experiences, events or ideas.” Also available is “auto-playing, larger live video in the home and global feeds,” which offers “a more beautiful, easy way to watch what’s live.” With the release of iOS 10, Periscope users on iOS can now send “signature Periscope hearts on iMessage with custom-designed stickers created for iOS 10” and have a “bigger, more beautiful watch and discovery experience” with the new Periscope iPad app. Foursquare Unveils Redesigned App: Foursquare unveiled Foursquare 10, “a redesigned version of the app that puts search front and center.” TechCrunch reports that the “new homepage offers a much faster search, with five chiclets that represent the six most popular searches: breakfast, lunch, dinner, nightlife, coffee/tea and things to do.” In addition, the Reviews section now shows “which ones come from ‘verified’ users and which aren’t.” The platform is also “adding rich text notifications for folks who are sharing Foursquare places” and the ability “to share place previews, complete with photos, without having to unlock their phones.” This Foursquare update coincides with the release of iOS 10 and the celebration of the platform’s 10 billionth check-in. 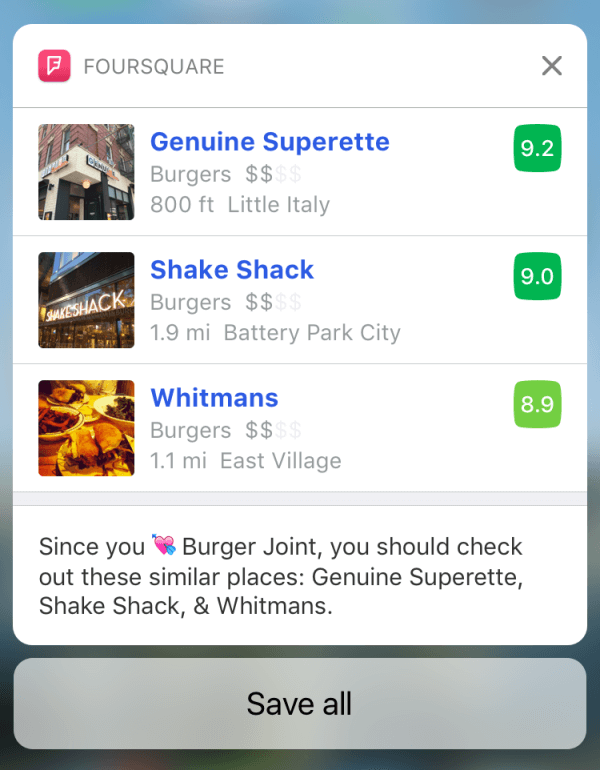 Swarm Adds Coin Perks for Check-ins: Foursquare’s Swarm app “teamed up with a small number of companies” to launch a new feature that makes it possible to exchange coins for perks and is “rapidly expanding the functionality” to other places. Users earn coins for checking into venues, “with bonuses for checking in with friends, collecting a number of the same types of venues (say, parks, bars or beaches) and various other activity in the app.” However, users were unable to “start spending those coins” until now. 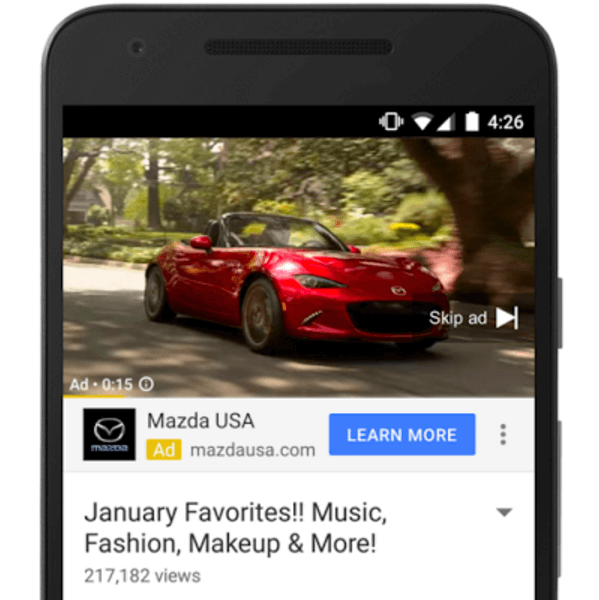 Google Tests TrueView for Action: Google released TrueView for Action on YouTube. This updated mobile-first solution is an easy add-on that “makes your video ad more actionable by displaying a tailored call-to-action during and after your video.” Calls to action can be adapted to specific use cases and “can help you move your customers along the path to purchase by encouraging actions like scheduling an appointment or requesting more information.” Google is currently testing this new format with advertisers throughout the rest of this year. Facebook Tests “People You Might Know” and Categories in Messenger: AdWeek reports that Facebook is testing a People You May Know feature and “categories to conversations between users and brands” within the Messenger app. When users are messaging a brand, a prompt appears and asks about the nature of their messages. Their response is then reflected in the conversation thread and communicated to the brand so they can be better equipped to serve users. Two examples of the conversation categories shown by AdWeek include Support and Getting in Touch. 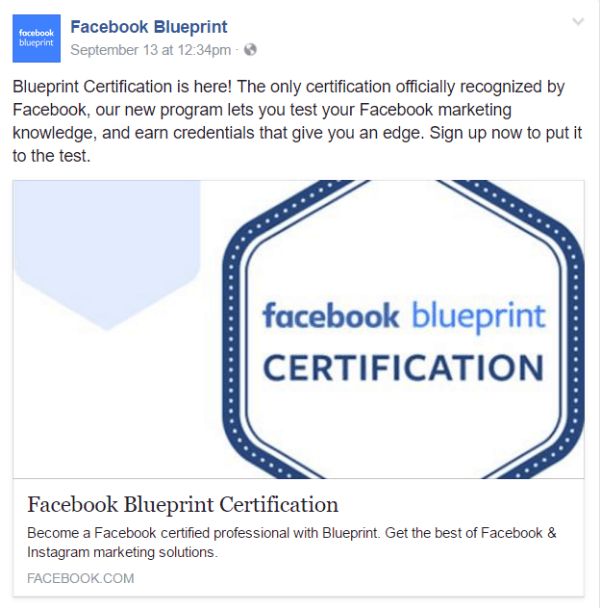 Facebook has not confirmed or shared any details about this test. Global Mobile Messaging Consumer Report 2016: Twillo commissioned a new study on consumer preferences when using messaging services and technology to connect with businesses and brands. Based on a survey of 6,000 consumers across Europe, Asia, and North America, the report shows that 9 out of 10 consumers prefer to use text messages, in-app chat, push notifications, or messaging apps to communicate with businesses. However, a majority of businesses continue to use the phone and email as their primary way to reach their customers and currently don’t have the infrastructure in place to utilize messaging services and technology instead. Sixty-six percent of consumers surveyed say they would like to reach brands through messaging apps, with Facebook Messenger (21%) topping the list, followed by WhatsApp (18%), LINE (6%), and Snapchat (2%). Best Practices for Supercharging Campaigns With Branded Emojis: According to research compiled by Twitter Marketing, Twitter ads with branded emojis receive nearly 10% more attention than those without branded emojis. Furthermore, branded emojis paired with a promoted video increase the emotional connection and interest in the ad by 6 times. The other findings suggest that the median earned media generated by branded emojis is 5.3 million tweet impressions, which is a 420% increase when compared with Twitter’s earned media baseline. 2016 Pinterest Media Consumption Study: Ahalogy released its third-annual study that measures how Pinterest affects consumer behavior and media habits. The report examines consumer demographics, habits, and behaviors and unique insights on why and how Pinterest is increasingly replacing traditional media as a content discovery platform. 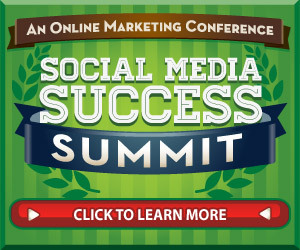 Join 4,000 fellow marketers at the ONLINE mega-conference designed to inspire and empower you — Social Media Success Summit 2016, brought to you by Social Media Examiner. You’ll soak in 39 social media marketing sessions taught by the top social media pros, including Mari Smith (co-author, Facebook Marketing: An Hour a Day), Michael Stelzner (founder, Social Media Examiner), Kim Garst (author, Will the Real You Please Stand Up), Joel Comm (co-author, Twitter Power 3.0), and Amy Porterfield (co-author, Facebook Marketing All-in-One for Dummies) — just to name a few. They’ll share their latest social media marketing tactics with you. Find new ways to improve your content and measure your results with sessions on video, live video, visual marketing, analytics, and marketing tools — all from the comfort of your home or office. What do you think of the new Facebook custom audiences targeting? 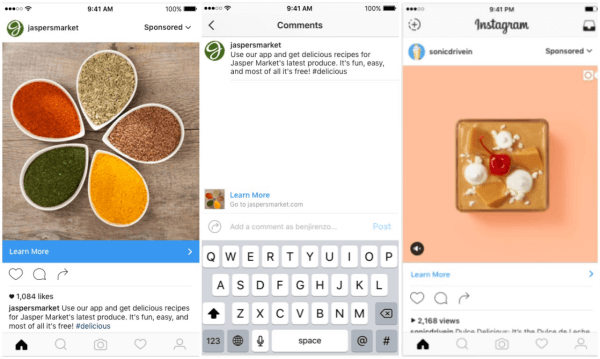 Have you tried the new call-to-action features on Instagram ads? Please share your comments below. 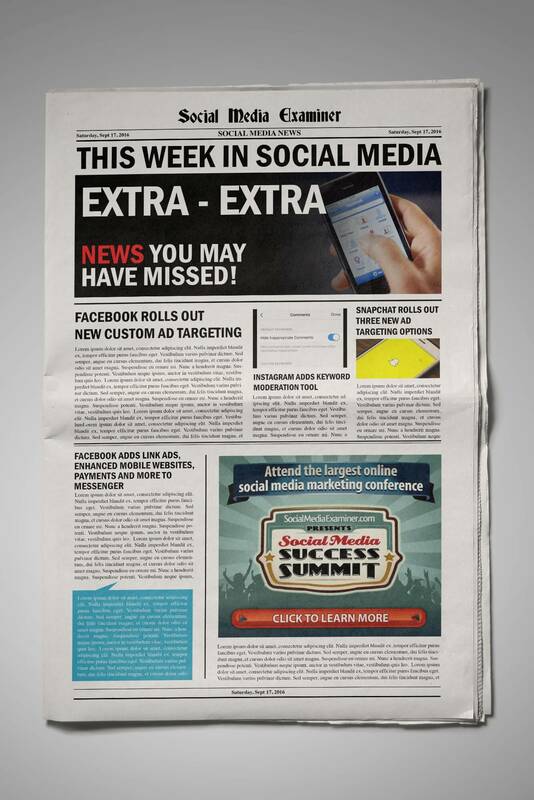 Facebook Custom Audiences Now Targets Canvas Ad Viewers and other social media news for September 17, 2016.